6500 Insulated Steel Commercial Garage Doors - The Wright Door Co.
DoorLink 6500 insulated steel garage doors are a fantastic option for businesses looking for a high-quality, insulated door to keep their business climate controlled and save energy. DoorLink garage doors are made in the United States and are long-lasting and durable. These doors have standard and optional features that make them a great choice for your industrial building. They are constructed with 2″ thick galvanized steel with pressure bonded insulation. They come with window choices and the option to add full view panels. Please see manufacturer info below for more technical specifications. 26 gauge interior steel panel with pressure bonded insulation. Panels have an embossed pebblegrain finish. Sections have tongue and groove meeting rails. 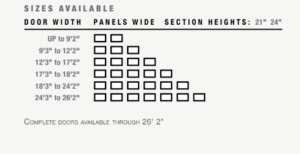 Optional windows in 24″ x 12″ or 24″ x 4″ sizes. Optional Series 8000 Full View sections can be substituted for steel sections. The galvanized track system is 2″ or 3″ depending on door size and weight. Optional track configurations include high lift, vertical lift, low headroom, and follow the roof pitch. The track is bracket or angle mounted as required. Commercial duty rollers are standard.